The Georgian opposition staged a rally, on December 2, in the center of the capital city of Tbilisi, protesting the outcome of last month’s presidential election. Demonstrators called for annulling the results of the vote as well as demanded early parliamentary elections (Agenda.ge, December 2). Several days earlier, the united opposition presidential candidate Grigol Vashadze openly declared that the opposition does not recognize the legitimacy of the second round of presidential elections, held on Wednesday, November 28 (Civil.ge, November 30). According to official data, the de facto representative of the ruling Georgian Dream (GD) party, Salome Zurabishvili, won the second round with 59.52 percent of the vote. Grigol Vashadze received 40.48 percent (Cec.gov.ge, accessed December 3). However, Vashadze and his opposition colleagues argue that in the second round, the authorities used dirty tricks, including bribing voters, blackmail and administrative pressure. In the first round (held on October 28), Zurabishvili was only 0.9 percent ahead of the runner-up opposition candidate—38.6 to 37.7 percent (see EDM October 31). GD parliamentary deputy George Gachechiladze said in a December 1 interview with the author, that Zurabishvili’s great advantage in the second round compared to the first boiled down to higher turnout. According to the Central Election Commission, turnout in the second round was indeed higher than in the first, by 10 percent (57 versus 47 percent). 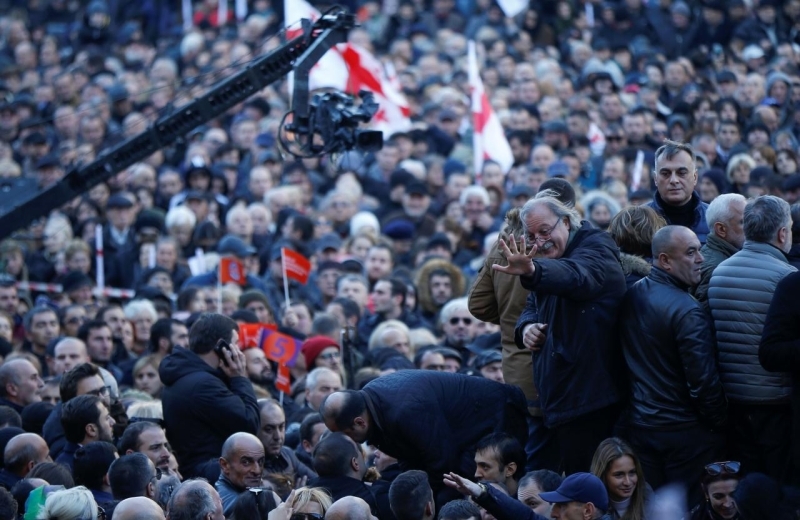 “Georgians did not want Vashadze to win, because behind him stands the former president, Mikhail Saakashvili, and many people remember the repression and human rights violations under his regime,” Gachechiladze argued. Nonetheless, the opposition is confident that the authorities “stole” the victory from Vashadze. One of the leaders of the European Georgia party, Davit Darchiashvili, listed some of the most odious of the government’s alleged methods: “The GD used criminals to intimidate voters, directly paid money to voters and used all administrative resources to help Zurabishvili” (Author’s interview, November 17). International observers have stressed in their reports that the presidential elections in Georgia were “free but unfair” (Civil.ge, November 29). Much of the concern has revolved around allegations of the authorities’ attempts to bribe voters. In fact, a few days before the second round, GD’s leader, billionaire Bidzina Ivanishvili, promised all Georgians unable to repay their mortgages or consumer bank loans that his Cartu Bank was ready to wipe out those debts. The total amount of such eligible “toxic debts” is worth up to 1.5 billion lari ($564 million) (Georgian Journal, November 21). Prime Minister Mamuka Bakhtadze personally announced this “humanitarian initiative” of his party’s leader, saying at a special press briefing that about 600,000 citizens (almost a third of the entire adult population of the country) “will be freed from their debts.” Bakhtadze denied any link between Ivanishvili’s promise and the election. The head of the Cabinet of Ministers claimed that Ivanishvili spent about $1.5 billion on charity in the last ten years, and the initiative to cover Georgians’ unmanageable bank debts was first put forward in the spring (Georgian Journal, November 21). Levan Berdzenishvili, one of the founders of the Republican Party of Georgia, told this author that the “debts repurchase” scheme, in his opinion, “is one of the most shameful Georgian stories.” He stressed, “I am ashamed that the billionaire [Ivanishvili] was able to buy many of my compatriots with this promise and they voted for Salome Zurabishvili in the second round. But it does not surprise me, because Georgia is a very poor country.” Berdzenishvili argued that the promise to liquidate the debts of hundreds of thousands of citizens before the election “is unprecedented even in the post-Soviet space.” He continued, “But if Ivanishvili had to use such a method, it means he was very afraid of the victory of the opposition. Yet, by doing this, he lost all his authority and became morally weak” (Author’s interview, December 1). Despite the critical comments of international observers, none of them have branded Zurabishvili’s victory at the ballot box as “illegitimate.” Georgia’s president-elect was congratulated by a number of heads of other states, including French President Emmanuel Macron (Civil.ge, December 1). Zurabishvili worked for many years in the Ministry of Foreign Affairs of France. In 2003, Paris sent her as an ambassador to Tbilisi. After the 2003 Rose Revolution, then-president Mikhail Saakashvili offered her the post of foreign minister in the Georgian government. But in 2005, she stepped down and became one of the most active critics of Saakashvili’s policy. Following the August 2008 Russian-Georgian war, she accused Saakashvili of provocation. And shortly before the 2018 presidential election, she said that the military conflict from ten years earlier was “started by Georgia.” Consequently, a number of former and current Georgian military officers expressed concern that, if Zurabishvili is elected, they might face extradition to the International Criminal Court in The Hague for alleged crimes committed in South Ossetia during the conflict with Russia and receive no protection from Tbilisi (see EDM November 13). Former state minister Paata Zakareishvili called Saakashvili a “provocateur.” Zakareishvili further asserted that were Vashadze elected, he, “like Saakashvili, would arrange provocations and help Russia carry out new aggression against Georgia.” On the other hand, Zurabishvili will speak with Moscow more diplomatically, although she will not achieve any success with her diplomacy” (Author’s interview, December 1). On the morning of December 2, a few hours before the start of the rally in Tbilisi, Saakashvili warned that the protest action should be peaceful and urged his supporters to “assemble peacefully on December 16 to prevent Salome Zurabishvili from being inaugurated” (OC Media, December 3). For now, “the storm of passions” in Georgia continues. Kate Gabiani, the founder of the non-governmental organization (NGO) coalition “European Georgia,” told this author that the December 2 oppositionist rally “is just the beginning.” Gabiani added, “We do not recognize Zurabishvili as our president. She is a traitor. She accuses her own country of starting the 2008 war.” And she claimed, “Zurabishvili plans to recognize the independence of Abkhazia and South Ossetia” (Author’s interview, December 1). For now at least, the opposition’s protests against what they see as the “illegal” election of Salome Zurabishvili have been peaceful. And their leaders, including Grigol Vashadze, pledge that they will not violate the country's constitution.